With the Forest River RVs, being out in nature does not mean you have to leave all of the luxuries of home behind. Every model is designed keeping the needs of the 21st century. With all the necessities you need at hand, you are at home wherever you go. And the room service is as impeccable as you can make it. Why should I go RVing? We say, why not go RVing! RV travel is a great way to see the country in comfort. RVing allows you to vacation without the stresses associated with commercial transportation and increased security measures. You do not have the cost of hotels and food can be prepared in the RV to avoid spending money dining out. It is also a great feeling to explore destinations at your own pace and even bring along items like bicycles that would otherwise have to be rented. If you are a pet lover, you no longer have to leave them behind or locate a pet friendly hotel. RVing with children is a wonderful experience as well because it gives them a chance to unplug and experience nature first hand. Besides, you'll never know what you are missing out on, if you never try. What RV type should I purchase? RVs are available in many different configurations. They can be pulled behind a vehicle or driven from what RVers call a cockpit. Towable RVs can be attached to your vehicles bumper hitch or to a specialized hitch in the bed of a pick-up truck. The sizes range from a small fold out trailer that has tent sides to a large 40 foot long motorhome. At Forest River, we are leaders in building RVs, but more importantly, we are experts in creating those exceptional moments of laughter and joy. We have RVs best suited for various needs, interests, budgets and lifestyles. Whether it is tent-campers, travel trailers, fifth wheel or a motorhome, each unit is very carefully crafted, awaiting a journey to begin. Knowing how often you plan on taking an RV trip is important to determine before buying an RV. RVers that travel often, for example every weekend, will usually look for a smaller easier to tow or drive model. If you plan on leaving the RV at a destination or staying in it for a long period of time, a larger RV model could be right for you. Be sure to check your desired RV vacation spots for their size requirements. It is important to determine what RV campgrounds and resorts are within your desired driving distance. A longer driving distance will require you to bring more food and supplies which will increase the weight of the RV. Having extra weight in an RV will affect how it tows and drives. Also, being far from home or civilization may require you to have an RV with extra amenities. There are many places that offer electrical and sewer hook-ups but is important to know where they are and how much it costs per night. 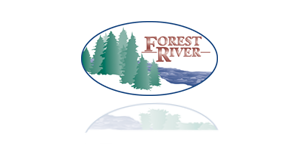 With Forest River RVs, being out in nature does not mean you have to leave all of the luxuries of home behind. Every model is designed keeping the needs of the 21st century. A single RV model can include a leather sofa, an oven to bake in, a washer/dryer combo and LED TVs connected to a satellite on the roof. They can also just include the basics like a comfortable bed and a place to dine with friends and family. Determining what you need to have in your RV to feel comfortable is important in order to enjoy the rving experience. 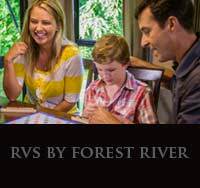 At Forest River, many of us are RVers ourselves. Hence, we understand the practical side of RVing and we take those into consideration in designing RVs that are well suited to your needs. The number of people that will be using your RV will determine your sleeping capacity and living space requirements. Many floorplans feature bunk beds that are great for children and guests. Most models have dinette tables that convert into a bed and some models feature a hide-a-bed sofa. If you need more living space then you may want to consider an RV with one or more slide-outs. Slide-outs are additional living areas that slide out with a push of a button.